An enhanced object browser that shows a structured view of object libraries. to make his own life easier, then decided to share with the rest of us. Object Model Browser is designed to provide structured views of an object or type library, displaying the parent-child relationship among the objects in the library in a tree-like form. In other words, unlike other object library viewers, Object Model Browser displays the object model for an object library. 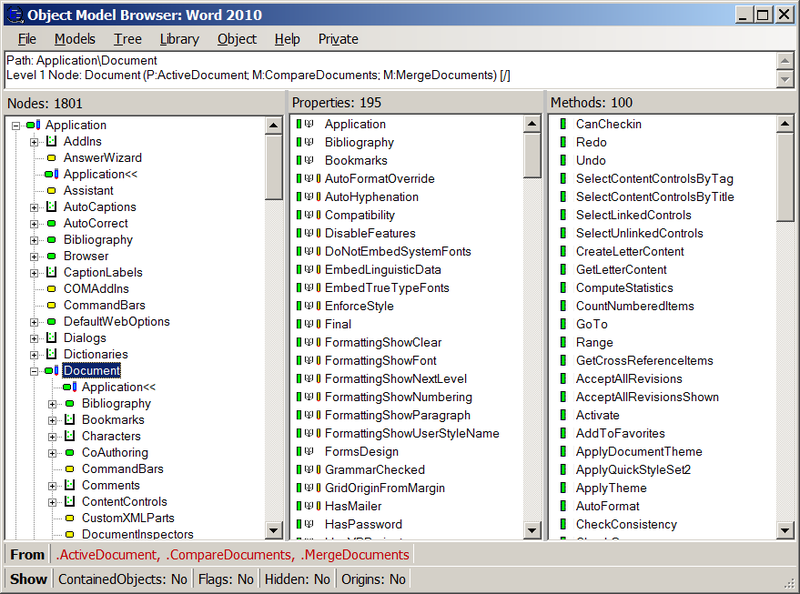 The figure above shows a portion of the object model for Microsoft Word 2010. Version 3 of OMB has been totally rewritten under the .NET framework. It has several improvements over the prior version. First, version 3 shows a more realistic view of object models with multiple top objects. Second, it does not require any user customization. (Version 2 has a Create Model Wizard, but this is not needed in Version 3.) Third, installation is now simply a matter of copying the files to your favorite folder and clicking on the EXE file. A trial version of OMB is available for download here. It is fully functional but only works with the Microsoft PowerPoint object model. To purchase the full version of Object Model Browser for $39.95, just click on the PayPal link below. Once we receive payment, we will e-mail you the full version.